In the days leading up to his Keynote Address at the Republican National Convention in Tampa, Chris Christie has launched his own Tumblr blog — complete with Instagram’d photos. In the past, I’ve written posts about how Christie has used the bully pulpit to get his point across through Twitter. And I’ve blogged about how his supporters have demonstrated that he’s not all that bad of a guy over YouTube. This latest social media venture, however, solidifies the New Jersey governor’s push to embrace social media. 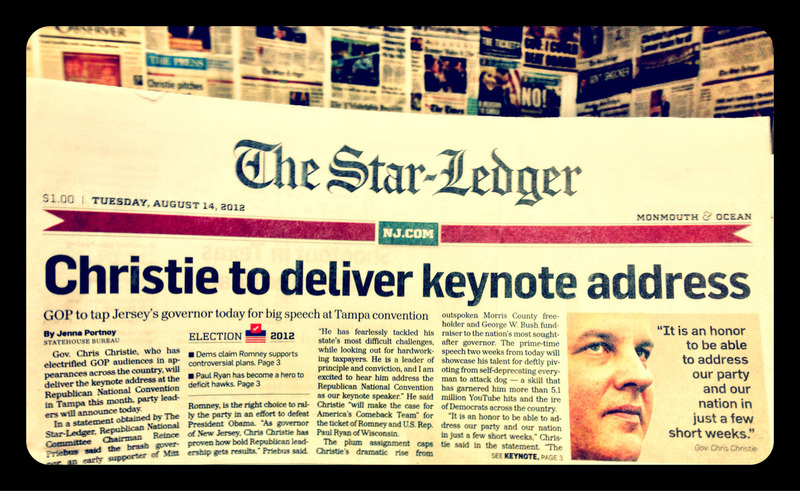 This is a classic move from the Christie communications braintrust. Before he delivered the State of the State speech this year, his office posted a video topromote it like a movie trailer. And to mark the 5 millionth view on his YouTube page, he posted a compilation of his most, well, memorable YouTube moments. The Tumblr, which includes behind-the-scenes pics, video of him practicing the speech and clippings from news accounts about the speech, is very much in the Christie mode of Political Communications 2.0. Even the name of the Tumblr site, Words With Christie, is a play on the popular iPhone game Words With Friends. Christie also has another undeniable presence on the blogging platform: Chris Christie Eats.